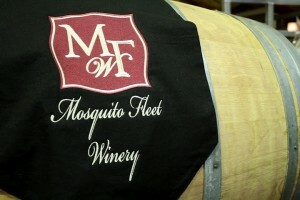 Mosquito Fleet Winery came to life three years ago in a Belfair warehouse. That’s when the first shipment of grapes made its way from various Eastern Washington vineyards across the Cascade Mountain range and into the industrial space where the winery’s four owners and numerous volunteers anxiously waited to partake in the winery’s inaugural crush. A lot has changed since that first crush party. Most noticeable is the transformation of the warehouse, which doubling as the winery, opened to the public for the first time last week for an inaugural release party. What once housed crushing equipment, including a destemmer and fermentation containers, is now lined with twinkling white lights, fishing nets and other nautical décor, stacked oak barrels filled with wine and photos of the winery’s first days. Winemaker Brian Petersen credits his wife Jacquie and business partner and close friend Jacy Griffin for the transformation. Griffin’s husband Scott is the fourth owner of the winery. “They had a vision for how it could be and they hit it out of the park,” Petersen said of the décor selections and attention to detail — like Reidel stemware and specialized decanters used to bring out the wine’s flavors before it was poured for guests. Another, less obvious transformation, is the amount of wine stored in the barrels. At its inception in 2009, the Petersens and Griffins purchased enough grapes to produce 200 cases. That’s on par with most small-scale wineries opening these days with a focus on quality handcrafted wine over quantity. But where the winery diverges from the norm is its growth between its 2009 vintage and its 2010 vintage. Instead of making a gradual increase in production over time as wine sales grew — the most common path taken — Mosquito Fleet’s production jumped from 200 cases in its first year to 1,000 cases for its 2010 harvest. The winery replicated that number with its 2011 harvest. If he isn’t already, Petersen should be known for his persistence. A chiropractor by day, Petersen set out on a mission to not only learn what he needed to create top-notch wines — attending a series of winemaking classes at UC Davis and picking the brains of some of the state’s most respected winemakers — but he also became determined to get his hands on grapes from some of the state’s most well-known vineyards. When others may have turned away after being told there was no fruit available, Petersen didn’t let up until he got what he wanted. Mosquito Fleet sources grapes from Elephant Mountain and Copeland Vineyard, located in the Rattlesnake Hills appellation in Yakima, and Double Canyon Vineyard located in the Horse Heaven Hills appellation. Double Canyon is adjacent to Champoux Vineyards, one of the state’s most highly regarded vineyards known for consistently producing some of the state’s best cabernet sauvignon. While it doesn’t carry the Champoux name, the grapes Mosquito Fleet receives share the terroir that sets Champoux’s vines above the rest, Petersen said. The winery added fruit from Kiona Vineyards in the Red Mountain appellation for its most recent vintages. But the vineyard Petersen is probably most excited about is his block within Pepper Bridge Vineyards, which is known for producing some of the most sought after fruit not only in the state, but also the Northwest. The winery’s cabernet sauvignon is 100 percent sourced from Pepper Bridge and after one sip the similarities are evident. Like Pepper Bridge’s cab, Mosquito Fleet’s cab is a deep purple color with tight tannins evident on the finish. Considering it’s the winery’s first release — along with a Meritage Blend that is Petersen’s take on a left-bank Bordeaux blend of cabernet sauvignon, merlot, cabernet franc and petit verdot — it’s evident the “go big or go home” motto has worked in the favor of the Petersens and Griffins who have maintained all along that they want to be known for producing quality wines. 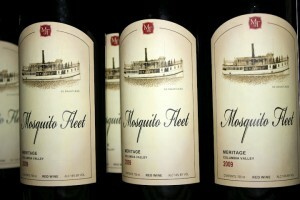 In 2010 Mosquito Fleet will again release a cab and Meritage Blend, but it will also add cabernet franc, petit verdot and a syrah, mourvedre, cab blend to its line up. The winery will also release limited quantities of its Touriga Nacional Port 2010, which is a blend of 18 percent Tinta Roriz and 82 percent Touriga Nacional — considered to be Portugal’s finest red wine grape. Mosquito Fleet’s owners have done a good job of marketing their product. A private inaugural release party drew close to 200 people last week and the winery saw around 250 people come through its doors on Saturday, the one and only day it opened to the public. The strong response solidifies efforts to market Mosquito Fleet Winery as a community winery, Petersen said. While he wondered whether they would sell out of the 2009 vintage after the initial opening, there are still some wines left. But because of the limited supply, the winery won’t open again to the public, at least not until 2013 when it’s time for the release of the 2010 vintage. Instead wines can be purchased at the winery’s website, or in the near future at an area wine shop. They’re also in the process of working with local wine shops and restaurants to feature the wines.